The concept of complete streets places the same priority on pedestrians, bicyclists and public transport users as on motorists. 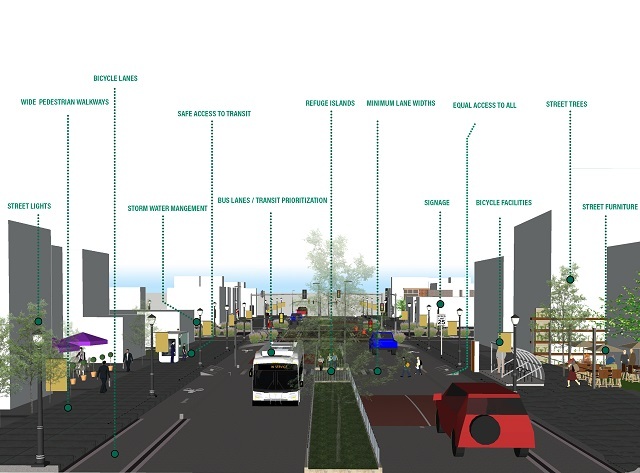 The initiative aims to improve the quality of life for all users by designing streets that are both safe public spaces and enable high-performance, sustainable transportation networks. The U.S. states of Oregon and Florida were among the first to elevate the needs of cyclists and pedestrians during roadway projects in the 1970s and 80s. Later, the Federal Highway Administration and U.S. Department of Transportation included elements of complete streets in its guidance. The National Complete Streets Coalition was founded by a coalition of advocacy groups, as well as the AARP, American Planning Association and American Society of Landscape Architects. They launched the complete streets movement in 2004, to promote the development and implementation of relevant policies and professional practices. To date, more than 1,140 agencies at the local, regional, and state levels have adopted complete streets policies in the United States, totalling more than 1,200 policies nationwide. 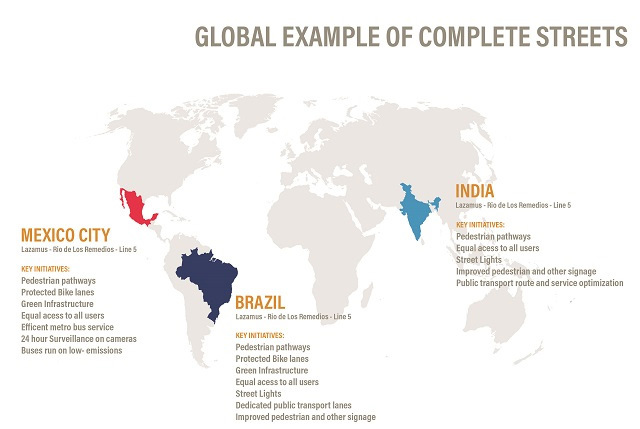 The success of these initiatives, in terms of promoting more active transport modes, more functional and attractive streetscapes, and reducing traffic fatalities, has led other countries to adopt similar concepts. They are the so-called calles completas in Mexico, ruas completas in Brazil, and “streets for all” in India. So, what do complete streets, in their various forms, look like? While the approach varies from place to place and it is crucial to understand a roadway in the context of the area around it, there are key elements that tend to appear in the mix. A community where people share experiences and interact on a day-to-day basis tends to be a safer community. A mix of interactive uses such as commercial, retail and food service can encourage an active streetscape. Commercial and retail facades not only encourage foot traffic but add colour and diversity to the street. Residential and office spaces, which receive less foot traffic, are better situated above the first floors. Plazas can also attract crowds and encourage pedestrian use. In terms of specific design features, transitions between sidewalks and plazas should allow easy access for all users, and in an era where people rely on smartphones for navigation, communication and socializing, public wi-fi can be a boon. Well-lit environments are just as important, if not more so, for pedestrians and cyclists as for motorists. Street lighting provides a safer and more secure environment in terms of both traffic safety and crime. Lighting also affects the way spaces are experienced. The lighting and ambience it contributes to can vary substantially for a plaza compared to an outdoor café or green walkway, for example, just as their users do. Public lighting adds to a city’s total energy consumption, so energy costs and sustainability should factor into designs. Many newer projects, like the Boulder Plaza in downtown Las Vegas, use solar panel technology and motion sensors to save energy and reduce environmental impact. Areas with trees, shrubs and grasses, often referred to as “greenscapes,” benefit cities environmentally, socially and economically. Rain gardens and bio-swales capture stormwater runoff so it infiltrates into the soil rather than flooding over concrete surfaces. Greenscapes help replenish groundwater reserves, provide relief from the “heat island” effect and filter polluted air. Some plants provide phytoremediatve properties that naturally clean hazardous pollutants in the soil. Green infrastructure also adds visual quality, character and health-restoring properties to a street. Studies show that even a short walk through a green space can reduce stress levels and improve people’s mental well-being. Street furniture has the potential to improve the experience of a public space and make it more active. It can take shape as benches and chairs or be integrated into walls, buildings, tree beds and planters. It serves as space for pedestrians to relax, enjoy and rest, encouraging foot and sometimes bicycle traffic. Bicycle racks, trash bins, bollards, community kiosks, art installations and transit shelters are forms of street furniture that have additional utility. Making streets more bicycle-friendly is often a central tenet of complete streets projects. The number of people choosing bicycles for short commutes tends to rise significantly after the introduction of protected bike lanes, for example. Various facilities, like bicycle parking, shelters and repair stations, also help improve the experience for cyclists and broadcast safety and comfort to users. They can also improve density and encourage compact development. In the space occupied by a single car parking space, it is possible to accommodate up to 14 bicycles. Traffic signs are designed to ensure the safety of all road users – pedestrians, cyclists and motorists alike. They serve as an important traffic management tool and should minimize the potential for errors by users. In terms of priorities for pedestrians, it’s important that signage clearly warns motorists where to expect crossings and indicate preferred crossing locations for pedestrians. Signage for cyclists can ensure they are on the right track if they are sharing a road or have the lane to themselves. It can also prepare users for changes in traffic and road conditions. Navigating a busy city can be challenging for anyone, let alone users with disabilities. Like buildings, roads should be designed to accommodate all people, regardless of their ability, disability or age, without the need for special assistance. In addition to accessible sidewalks and crossings, attention should be paid to design details such as guide strips for the visually impaired; sidewalk materials and tactile markings to avoid slips and falls; clearly marked parking bays for people with mobility constraints; compliant Braille signage; wheelchair ramps; and markings for motorists near special needs schools and similar zones. Finally, material selection for streets and public spaces can have an impact on durability, sustainability, safety and the experience of users. In general, permeable paving materials such as porous asphalt, permeable concrete and soft paving are more desirable over non-permeable ones. They aid in reducing stormwater run-off, require less maintenance and improve water quality. They can also provide grip and ensure pedestrian safety even during difficult weather conditions. Other factors include road function, type of traffic, vehicle and pedestrian flows, site topography, type of subsoil, functionality and cost. Complete streets designs ensure mobility to road users of all types by designing facilities that are safe, accessible, and welcoming. They can improve the efficiency of a space, reduce congestion as well as improve the performance of transport networks. Keep an eye out for elements of complete streets in your neighbourhood – and if you don’t see them, help make cities better for everyone by getting involved or speaking to your local government. Nikita Luke is a Sustainable Transportation Intern with the Health and Road Safety Program of WRI Ross Center for Sustainable Cities. Ben Welle is the Global Health and Road Safety Manager for WRI Ross Center for Sustainable Cities.